Upon your arrival at the airport, meet our representative awaiting just outside the arrival hall, past the customs area & currency shops. Later set on a journey to your next destination, the Pink City of Jaipur. Enjoy a hearty breakfast at the hotel and leave for a half-day sightseeing tour to the hilltop fortress of Amber. 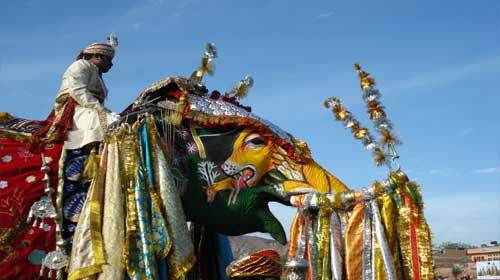 A small trek up the hill will be covered while riding an elephant in the royal manner. The fort was built in 1592 under the reign of Raja Man Singh and was later modified by successive rulers for next 150 years. Today the structure stands with its beautifully carved ceilings, intricate patterns and stunning designs. In the afternoon, tour the old walled city of Jaipur. Visit the unique Jantar Mantar Observatory- an assortment of architectural astronomical instruments. Built by Maharaja Jai Singh II it consists of fourteen major geometric devices for measuring time and predicting eclipses etc. Stunning City Palace will be the next destination on this city tour. City Palace is a complex of various palaces in Jaipur which is an erstwhile seat of Maharaja of the region. Driveby the stunning Hawa Mahal, a palace with hundreds of ornamental windows, built for royal ladies to be able to watch the daily processions of city. Leave for Bikaner, a remote town tucked away in the Thar Desert. Upon arrival, check in at the hotel for overnight stay. Morning trip is the visit at the 'Havelis' of Mandawa. Explore some of the finest works of frescoes at these havelis in Mandawa. Once in Bikaner and after lunch, proceed on a sightseeing tour. A medieval labyrinth of narrow streets opens up to stunning dark-red sandstone havelis and some exquisite Jain temples. The desert town continues to impress with its imposing fort and increased popularity of camel safaris. Take a trip to massive Junagarh Fort, the 5.28 hectares large precinct of the fort is laced with impressive palaces, exquisite temples and pavilions. Laxmi Niwas Palace is the next highlight of the city tour. The palace built in Indo-Saracenic style is also a luxury hotel and thus provides an opportunity to live life King size. Also visit the Camel Breeding Farm, an institute for research work on camels. The research institute houses a camel museum, which is a tourist attraction. In the afternoon you will be driven to Bikaner. Leave for Bikaner, a remote town tucked away in the Thar Desert. Once in Bikaner and after lunch, proceed on a sightseeing tour. A medieval labyrinth of narrow streets opens up to stunning dark-red sandstone havelis and some exquisite Jain temples. The desert town continues to impress with its imposing fort and increased popularity of camel safaris. Take a trip to massive Junagarh Fort, the 5.28 hectares large precinct of the fort is laced with impressive palaces, exquisite temples and pavilions. Laxmi Niwas Palace is the next highlight of the city tour. The palace built in Indo-Saracenic style is also a luxury hotel and thus provides an opportunity to live life King size. Also visit the Camel Breeding Farm, an institute for research work on camels. The research institute houses a camel museum, which is a tourist attraction. In afternoon, leave Bikaner for Jaisalmer. On arrival, check-in at the hotel. Rest of the day is at leisure. Morning, take a city tour of Jaisalmer. A Golden City echoing stories of valour and wars for honour, Jaisalmer bedazzles its visitors with its magnificent fort and exquisite mirror work and embroidery. Crowned by Jaisalmer Fort the city also offers lots to be seen including museums and havelis. After breakfast, treat yourself to a visual feast as you tour the golden city of Jaisalmer. Hewn entirely out of sandstone, the city is a tawny colour in the day and at sunset it magically morphs into honey-gold hue. Afternoon drive to Khuri, a quaint village with clusters of thatch roof houses. On the sand dunes here, take a sunset ride through the scrubland of Rajasthan on a camel safari that is a lifetime experience. Later in the evening take an excursion to Sam - 45 kms away, which is known for its sand dunes & is the venue for the Desert festival. Get the real feel of the desert by enjoying a camel ride on the sand dunes. This morning leave for Jodhpur. The city painted in blue, Jodhpur is the renowned Blue City of Rajasthan. Featuring various forts, palaces and temples in the middle of stark landscape of Thar Desert, Jodhpur paints the region in the colour of royalty. The houses painted in blue colour around and the vibrant bazaars add joviality to the deserted region. Afternoon visit the Mehrangarh Fort, which literally means "Majestic Fort", located at the very centre of the city. Close to the fort complex lies this white marble cenotaph, built in 1899, in commemoration of Maharaja Jaswant Singh II. At the foot of the fort, lies the "Jaswanth Thada", a richly carved white marble cenotaph. Take an afternoon jeep safari to the picturesque Bishnoi village to experience rustic Rajasthani life. The drive through the countryside abounds with black bucks and chinkaras grazing serenely and migratory birds dot the skies. Also visit the Clock Tower - the city centre. This morning drive to Delhi, followed by o/n stay. Visit the eclectic mix of modern and cosmopolitan worlds of India and take a sightseeing tour of New Delhi. Once called Lutyens’ Delhi, the area of New Delhi was designed by British architect, Sir Edward Lutyens. These glorious imitations of Victorian style architecture have always been an eye-candy for the connoisseurs of art and architecture. Enjoy a drive past monuments of national significance such as President’s House, Parliament House & India Gate.